Read ahead for a look at adidas Basketball's latest signing, strategy in adding new players and future NBA Draft outlook. The NBA Draft is an inexact science in many ways. For the teams looking to change the fortunes of their franchises overnight, and for the sneaker brands looking to raise the profile of their stable of endorsers, each year there are 19 and 20 year-olds chosen at the top of the lottery and signed to major endorsment deals with unparalleled pressure from day 1. In just the past five years alone though, we've seen a huge shift in how footwear brands are signing players from the draft. Gone are the days of $60-$90 Million contracts for the can't-miss stars, as brands have become apt to shell out an initially more modest four or five-year deal for the top picks. The huge shoe deal paydays are coming around on the second contract, like we most recently saw with All-Star point guard Damian Lillard, and can expect to see this summer for the likes of Kyrie Irving, Paul George and others. As adidas Head of Global Basketball Sports Marketing for the past four years, Chris Grancio is not only tasked with leading the brand's partnerships with its NCAA teams and the NBA, but he also helps to lead the Sports Marketing group that signs players to endorsement deals. In just the past three years alone, there's been a renewed importance on the annual NBA Draft, as well as a revamped roster of players that've gotten younger, fresher and more talented. While people internally at the company have raved about his immediate impact, his work has also been recognized outside of the Portland-based headquarters, as the former 4-year starter on the Harvard Basketball team was named to Sports Business Journal's coveted 40 Under 40 list. 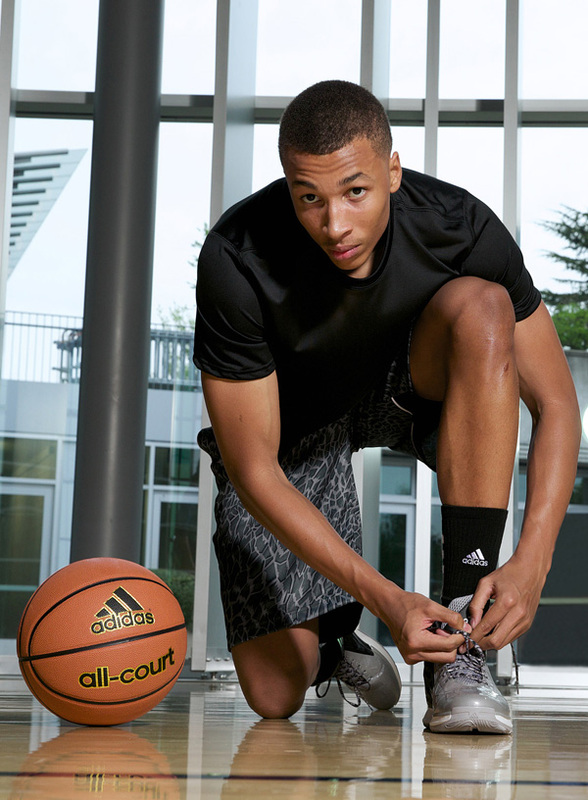 Adding to the likes of Damian Lillard, Iman Shumpert, Kenneth Faried, Harrison Barnes and John Wall, who's endorsement contract was shifted over from adidas' subsidiary Reebok last year, the latest draft prospect that Grancio and the adidas Basketball team are eager to welcome to the family is electric Australian combo guard Dante Exum. Expected by many to be taken in the top half of the 2014 Draft's lottery, the 6'6" Exum's game is beloved by scouts for his natural court instincts, vision and leadership. 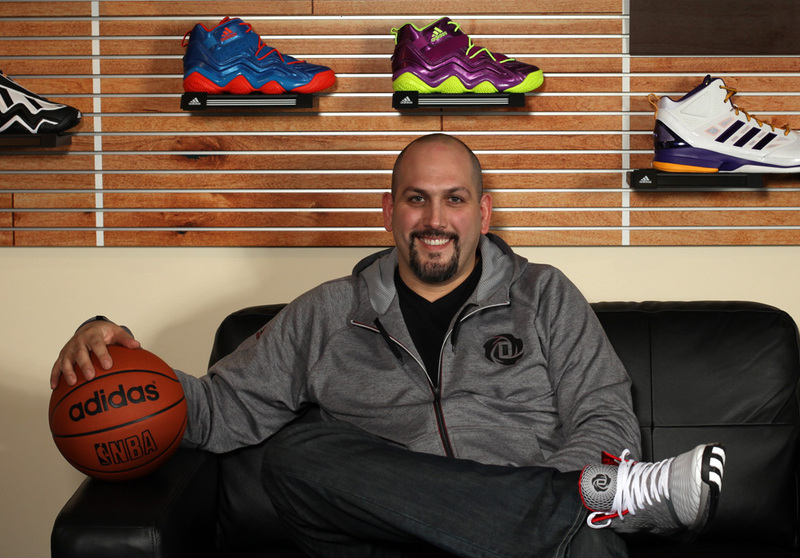 To hear all about the brand's latest signing, strategy in adding new players and outlook for future NBA Drafts, we recently caught up with Chris Grancio at his NBA memorabilia-filled office at the adidas Village headquarters. Nick DePaula: Can you tell me a little about your background and when you joined the brand? Chris Grancio: I actually joined the company just before the Germany World Cup in 2006. So I measure my career in four-year increments. [laughs] We're now coming up on Brazil, so it'll be my third. It was a great opportunity, and I came on to head up the US Basketball business, and my boss left about a month after I started, and Lawrence Norman came into that role. We've had a tremendous amount of continuity since then running the US business and working with retailers and merchandizers. Then, I had an opportunity to take over our global partnership with the NBA. As a global sports brand, it seemed like a great idea for me to learn more about different parts of the world. At that point, all of my experiences had been in the US. I did that for a couple of years, and then I grew into my current role, where I help to lead the athlete and grass roots divisions, in addition to what I was already doing with the NBA. And what year did you take over the charge with the NBA? You really do go by increments of four years. Yeah, and I came into the NBA role in 2008, and now I've been doing this job for the past four years. Once you got into that role, what were some of the things that you wanted to shift from a strategy standpoint, to either get after or improve upon? For us, at the time, we had really changed our footwear strategy, and we were coming off of a couple years of Team Signature, and the opportunity for me when I looked at it was, first, there's a big learning curve on the athlete side. Although I had played basketball, I didn't really have many relationships in the community, with the agents, and I didn't really know our players. So there was an introduction period for me there. One of the key things that I really saw as being critical was renewing our player portfolio, just by being consistent and aggressive in the draft every year. That's something we started in 2010, and have continued forward since and are certainly going to do this year as well. In order to fulfill our role in sports marketing, we have one primary function in the company, and that's to authenticate the brand on the field of play. For us, that means having a partnership with the NBA so that athletes are wearing our uniforms, but also, partnerships with players in the league that are wearing our product. Not only to authenticate, but also to inspire. If you think about who our players are, it's really making that connection to kids. Is there a certain type of player, demeanor or personality that you're looking for when you guys look at signing players in the draft? 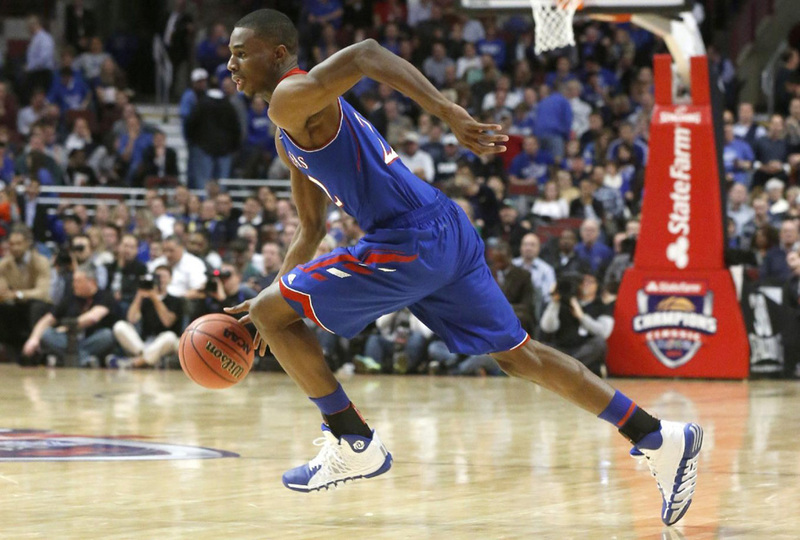 The point guard position has also been a particular position of focus of late. We want players that are exciting and are representing our products. When we talk about our product family, whether it's Crazyquick, Crazy Light or some of the things that we have coming in the future, we definitely want players that have those attributes that can represent those products really well. At the same time, there's always a home in our brand for a superstar like Dwight. So we certainly look across the board at all of the players that we think can have that kind of connection with the consumer, but there's always a focus on the guards and wings that are most exciting. 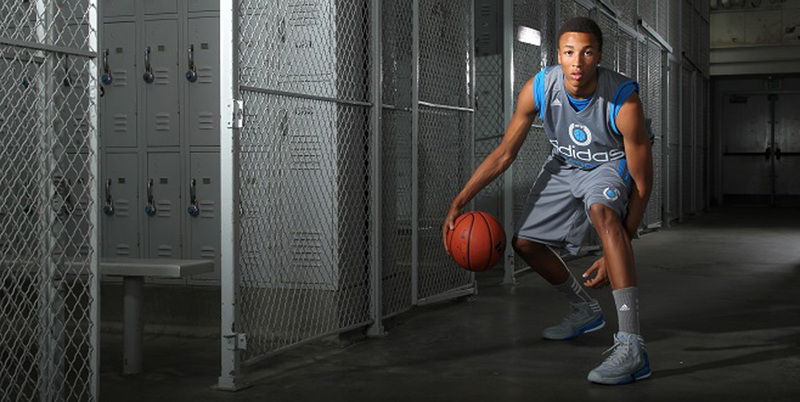 Dante Exum is of course the most recent guard that came into the fold. What is it about him and his style of play that was really exciting for you guys? We've had the pleasure of knowing Dante for a few years. We've had a collaboration with the Australia Institute of Sport, and through that, we actually had a team come over in 2012 to participate in our Super 64 tournament. We also had them come over for adidas Nations, and it was fun to be there, to sit in the gym and watch him play for the first time. I knew the name, but I hadn't seen him play in person before. That team in particular surprised a lot of people. Dante really hit the US basketball consciousness at adidas Nations, and nobody really knew much about him before that event. He led the Australia team to the 3rd Place Game, and they had gotten all the way up to the semi-finals. They ultimately lost in the 3rd Place Game and got 4th, but for him and his teammates, that was after a long two weeks. Our Nations program has become a proving ground for Serge Ibaka coming out of Congo, to Steven Adams out of New Zealand. And now, Dante out of Australia. It's been a really good platform for athletes that might not otherwise have that chance to be seen. In the last five years, there's been a big trend where brands have waited to see where a player will land in the Draft first before signing them. You obviously signed Dante before the draft. Can you talk about why you guys were so aggressive here? We love Dante, and not only do we think he is a fantastic athlete that has the potential to be an NBA All-Star with the way that he plays, but we also love his personality, his work ethic and the way that he's wired. Those are things that we look for in all of our athletes, and it's not only about how do they perform on the court, but at the end of the day, we're also looking for guys that represent our brand values of being authentic, honest, committed, passionate and inspirational. He really checks a lot of those boxes, and having gotten a chance to know him, he's just someone that we're happy to have as part of our brand family. It's also a bit of a unique situation with him finishing the year in Australia and not being in the NCAA tournament, it just gave us the opportunity to have that conversation a little sooner than we can. Most college players are just declaring now, so it isn't usually until the end of April that we can have those conversations, but with Dante's situation, we were able to discuss things much earlier, figure out if he wanted to be apart of the brand, and we think he's going to be a lottery pick. There's obviously a lot of uncertainty in terms of which team is going to draft him and where he's going to go, but we feel pretty strongly about bringing him into the brand. Which was the first draft that you really helped to lead? 2011, in terms of really having an impact. The 2008 Draft [Derrick Rose, Michael Beasley, Eric Gordon, Lopez Twins, etc] was before my time, we weren't really active in 2009, and then we signed a couple of players in 2010 – Derrick Favors and Wesley Johnson. The 2011 Draft [Brandon Knight, Alec Burks, Iman Shumpert, Kenneth Faried, etc] was the first class that we really got the strategic pieces in place, had a clear vision for how we wanted to do it and executed it. That was the first year we did our Rookie Orientation here [at the Portland headquarters], to really bring guys into the brand in a way that helped them understand who we are and gave us a chance to understand more about them as well. For awhile, it seemed like the strategy was to sign three or four guys, but now, you're really being more aggressive and going after eight to ten guys. Is there a specific number or range of guys you're looking to get each draft? Not really, and we pride ourselves on being able to provide a really high level of service to our players. Our goal isn't to have forty, fifty or sixty percent of the players in the league wearing adidas. We're really focused on having the right players. Part of that function of wanting to have five or six All-Stars, is you need to have a certain number of guys. For us, it really was focusing on rebuilding, and in order to do that, we needed to turn the portfolio over and to get younger and fresher, we needed to do that faster and go after more players through the draft. It's certainly been a noticeable shift in just the past few years, and in Dame's Draft in 2012 you guys were also able to get a nice batch of quality guys. The 2013 Draft was a little more quiet just in general, but I'll be curious to see how this summer's class goes. It's interesting, because this one had a reputation that started at a very high level, and then you hear lots of inconsistency as guys actually played through the college season. Now, you're hearing lots of GMs who are down on this draft, and the question is whether they're really down on it, or whether they're playing games. For our business, it's still an exciting draft, and there's still great, talented young players that we think are going to be All-Stars someday. It's a very big contrast to next year. Next year's draft has a phenomenal group of young players, but they're all centers and power forwards. For a GM, it'll be a fantastic draft. For our business, it's a little bit less appealing. It's clearly an opportunity for us this year to try and cover some ground.